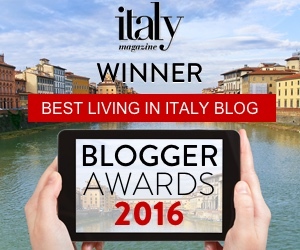 Bleeding Espresso is the award-winning website of Michelle Fabio, American lawyer-turned-dual Italian/American citizen freelance writer/editor. Michelle has lived in her ancestors' medieval hilltop village of Badolato on the Ionian Coast of Calabria since 2003 and has blogged about life in the toe of the boot since 2006. In 2016, she published a book about her adopted home region, 52 Things to See & Do in Calabria. You can also find Michelle at her professional site, MichelleFabio.com, and occasionally at Baby Espresso, where she writes about finding humor in motherhood in rural southern Italy. Bleeding Espresso is on Facebook, and Michelle is on Instagram, Twitter, and Pinterest @michellefabio. If you would like to work with Michelle or have questions or comments, feel free to contact her.